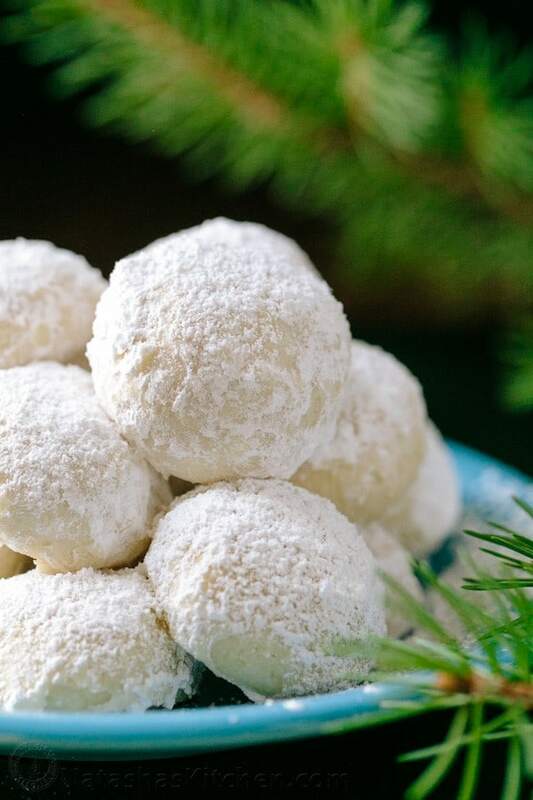 These almond snowball cookies just melt in your mouth. 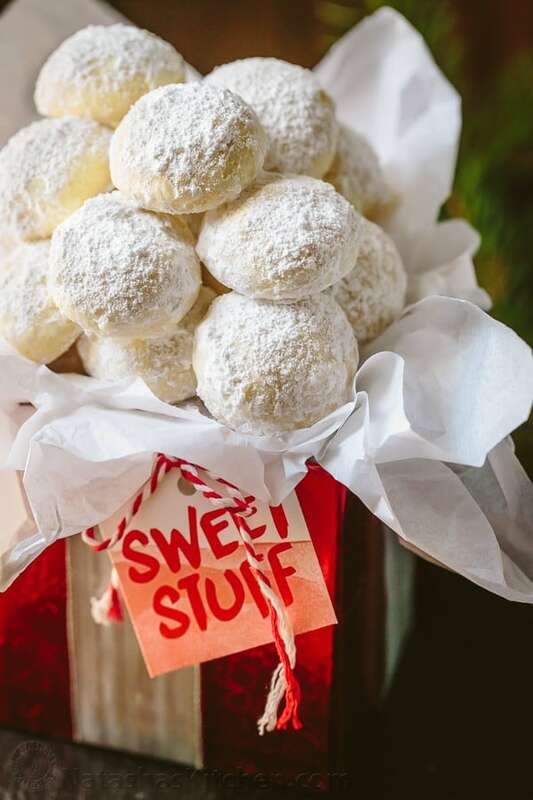 They are perfect Christmas cookies and look like darling little snowballs. They remind me of these Russian Tea Cakes but these snowball cookies have more of a melting consistency. Get it? Melting? Hee hee. The almond paired with orange zest is a delicious and highly addictive combination. Here’s the story behind these: I bought tons of almond meal/flour for the endless macaron testing that I did and had some leftover so I decided to try it in these snowball cookies. And WOW!!! 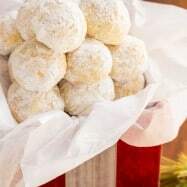 These are melt-in-your-mouth good and the best snowball cookies I’ve ever had! We added Amazon affiliate links below for tools used to make this recipe. 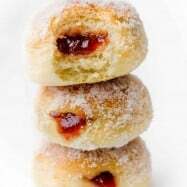 Can Snowball Cookies be Frozen? This snowball cookie recipe freezes really well so they are a make-ahead cookie #SCORE!! Make them fully including powdered sugar and just dust with fresh powdered sugar once they are thawed and sitting on your cookie platter. They’ll taste just as good as the day you made them! We used store-bought almond meal/flour. The package should say either “Extra Fine Almond Meal” Or “Almond Flour”. You can make your own almond flour using blanched almonds. Use unsalted butter for this recipe. Do not skip the oranze zest. A little goes a long way in both flavor and aroma. For the cookies to form correctly, dry ingredients must be measured correctly. Preheat the oven to 400°F. Line 1 extra large (I LOVE that I can fit them all on this 3/4 size cookie sheet) or use 2 regular cookie sheets with parchment paper. 1. 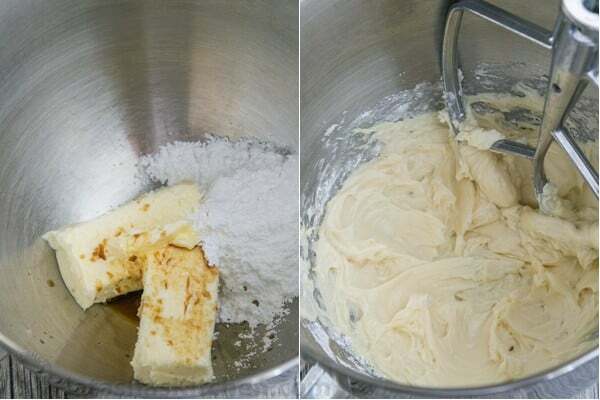 In the bowl of a stand mixer (highly recommend this mixer) fitted with the whisk attachment, cream together 2 sticks butter, 1/2 cup of powdered sugar and 1 tsp of vanilla, until smooth. 2. Switch to the paddle attachment and gradually mix in 2 cups all purpose flour and 1/2 tsp salt. Once well incorporated, add 1 cup almond meal and 1/2 Tbsp orange zest and mix until well incorporated. The dough stuck slightly to the spatula but not at all to my hands. If very sticky, add 1-2 Tbsp more flour (I didn’t need to). 3. Shape dough into 1-inch balls (this small ice cream scoop made it so easy and exact!) and place them on prepared baking sheet 1 inch apart. You should get 38-40 cookies. Don’t make them too large or they won’t bake through properly. Bake 11-13 min, or until bottoms are golden and edges are barely golden (I bake 11 min for softer cookies). Remove from baking sheet and let cool 5 minutes. 4. 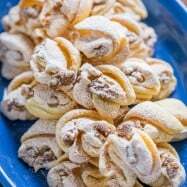 Fill a bowl with powdered sugar and roll the cookies in it while they are still warm (not hot, or they make the powdered sugar gummy). Transfer cookies to a wire rack to cool completely. It’s best on a wire rack so the powder sugar doesn’t become moist but they will still be ok if they cool on the parchment paper. 5. 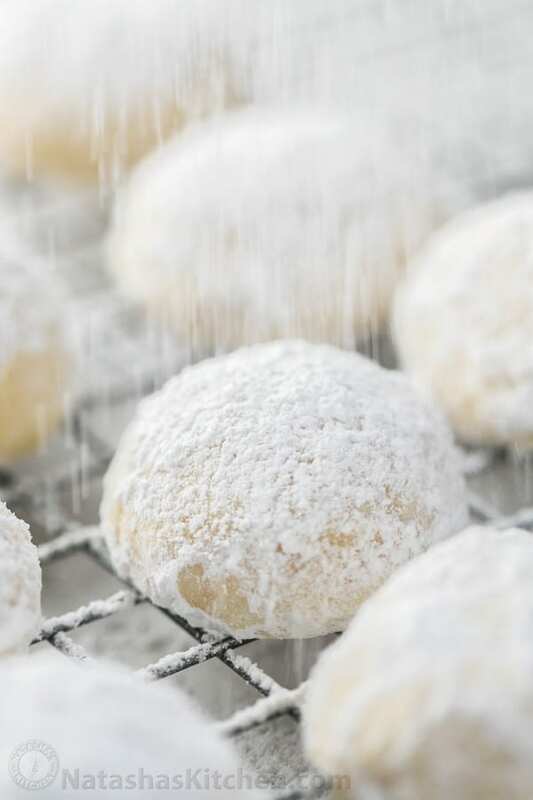 Once cookies are at room temperature, roll in powdered sugar again or dust the tops with a mini sieve (here’s the one in my picture) to give them that snowy look. We love these tea cookies year round (not just for the holidays), but they sure are a treat and look beautiful on a Christmas cookie platter! Baklava – the ultimate holiday treat! 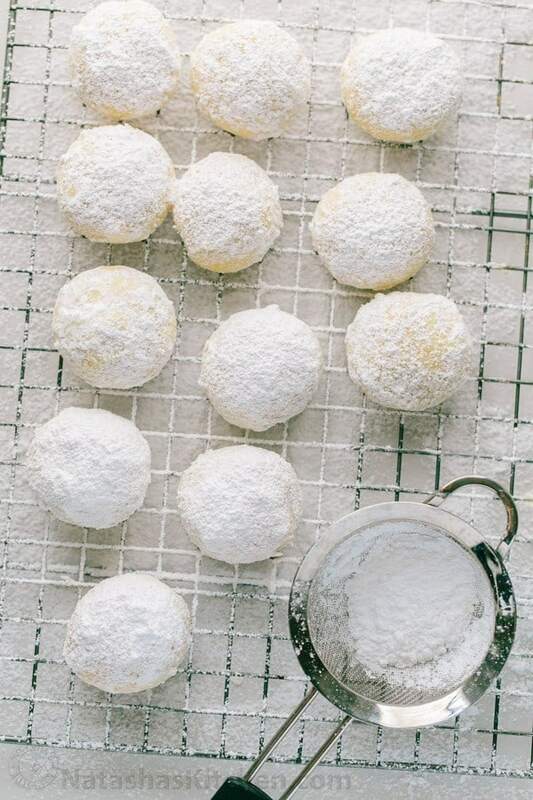 These almond snowball cookies just melt in your mouth. They are perfect Christmas cookies and look like darling little snowballs. Preheat the oven to 400°F. 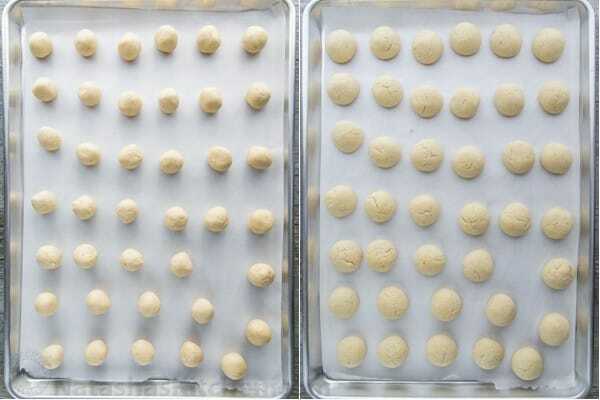 Line a 3/4 size cookie sheet or 2 regular cookie sheets with parchment paper. 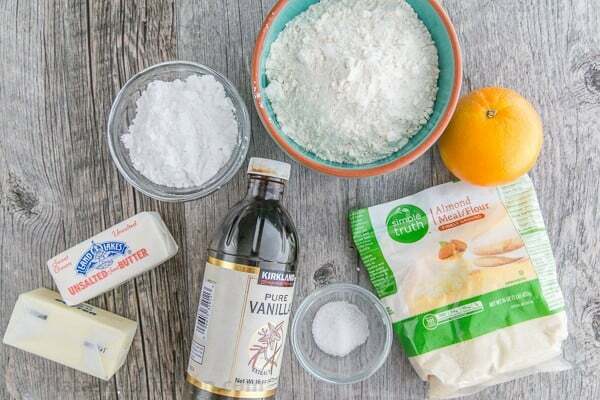 In the bowl of a stand mixer fitted with whisk attachment, cream together 1/2 lb butter, 1/2 cup powdered sugar and 1 tsp vanilla, until smooth. Switch to paddle attachment and gradually mix in 2 cups all purpose flour and 1/2 tsp salt. 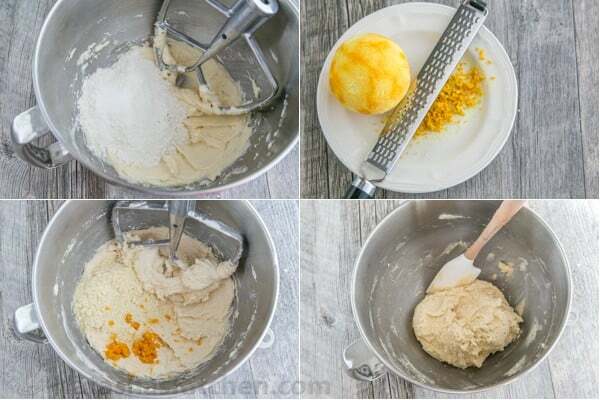 Once incorporated, add 1 cup almond meal and 1/2 Tbsp orange zest and mix until well blended. The dough will stick slightly to the spatula but not to finger tips. If very sticky, add 1-2 Tbsp more flour. 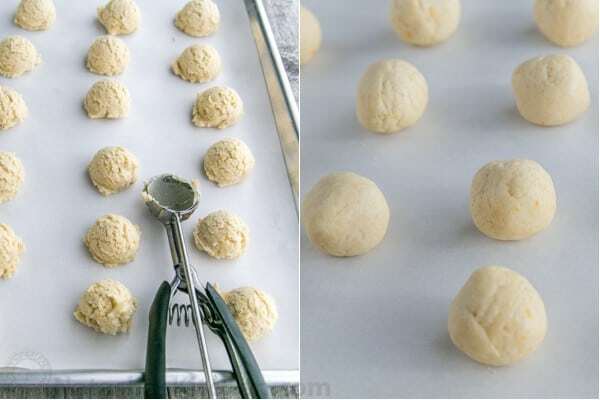 Shape dough into 1-inch balls (a small ice cream scoop makes it easy and exact). Place them on prepared baking sheet 1 inch apart. You should get 38-40 cookies. Don't make them too large or they won't bake through properly. Bake 11-13 min, or until bottoms are golden and edges are barely golden (I bake 11 min for softer cookies). Remove from baking sheet and cool 5 min. 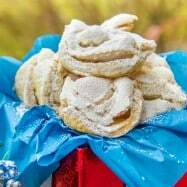 Fill a bowl with powdered sugar and roll the cookies in it while they are still warm (not hot). Transfer cookies to wire rack to cool completely. 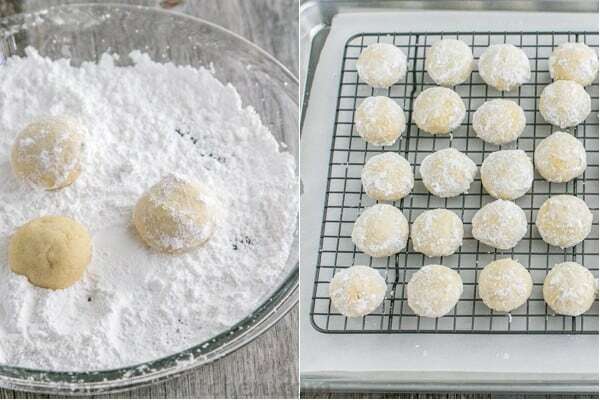 Once cookies are at room temp, roll in powdered sugar again or dust the tops with a mini sieve for a snowy look. Bakers Tip: *To measure flours, spoon into a measuring cup and scrape off the top. Natasha, I made your cookies and everyone who ate them liked the orange zest flavor. In my opinion, your snowball recipe is the best I’ve had thus far, and I will continue using your recipe. In addition, I followed the advice of another woman regarding an easier way to apply the powdered sugar. I added the first coat after they completely cooled by placing them in a ziplock bag with powdered sugar. Then I stored them in the freezer until I was ready to serve them which for me was 4 days later. I took them out and added the second coat. Her way not only saved me time but was much easier and less messier. I’ve following you and your recipes for a longer time and even tried lots of them. “Go to” yearly cookie for 40 years. Collect Xmas tin from thrift stores after holidays and save to fill with “ tea cakes” snowballs or what your name is for these delights. This is my first time to make these cookies as Christmas Gift to my friends. So, how long keep storage for these snowball cookies? Can you please indicate weight, haw many grams is the butter? In Europe the products are measured in grams. These look heavenly and anxious to make them soon. 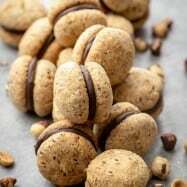 Not a fan of almond flavoring – can all while flour be used? Can u refrigerate this dough before making them? Natasha, this recipe couldn’t come at a better time. 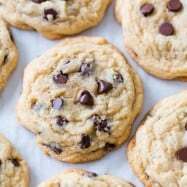 I opened your website to find a recipe for another type of cookie, since I was invited over to a friend’s house the next day, and this was front and center. I decided to make them since they only took about half hour and I happened to have almond flour. They are the most delicious cookie i’ve tried. I gave some to our neighbor, and she’ll be making them for Thanksgiving too. Plus because this took me so fast to make, I was also able to bake your shortbread cookies with raspberry preserves (which my husband thinks is an even better cookie – differences attract I guess :-)). Natasha, it looks like my mom uses walnuts instead of almonds, but you can use almonds she says. She also does not use any mixers. And no orange zest. Other than that, it’s very similar. Maybe I will put the recipe on my blog before Xmas, I think people would like it. I’d have to translate it from grams so it makes sense for my USA readers.